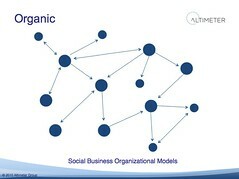 Organic: Notice that the dots (those using social tools) are inconsistent in size and one set of employees are not directly connected to others. 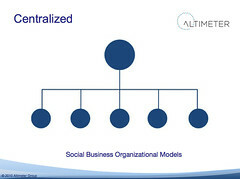 Centralized: Notice that a central group initiates and represents business units, funneling up the social strategy to one group. Coordinated: Notice how a central group will help to provide an equal experience to other business units. 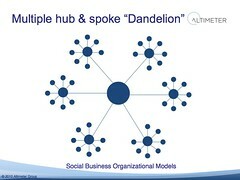 Multiple hub & spoke “Dandelion” notice how each business unit may have semi-autonomy with an over arching tie back to a central group. 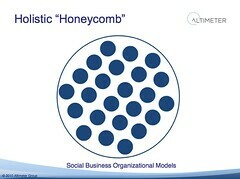 Holistic “Honeycomb” notice how each individual in the organization is social enabled, yet in a consistent, organized pattern. Organic Social efforts bubble up from the edges of the company, much like Sun Micrososystems encourage a blogging culture for all employees. Looks authentic and therefore trusted as multiple conversations appear closer to products and customers. Inconsistent experience to customers, one side of the company has no idea what the other side is doing, and multiple enterprise software deployments. Later, a nightmare for IT data management and marketing. This model is typical in large companies where control is difficult to enforce and often in software based companies. Mostly, I see companies transitioning out of this model. 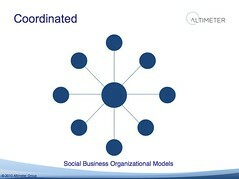 Centralized One department (Usually corporate communications) controls all social efforts. See how Ford has deployed their efforts to engage in the tough discussions while staying on brand. Great for consistent customer experience, coordinated resources, and rapid response May appear very inauthentic as press releases are rehashed on blog posts or videos by stiff executives. Great for regulated industries or brands over scrutiny, yet make sure you bring forth the employee voices –not just faceless logos, notice how Ford’s Scott Monty is front and center. Coordinated A cross-functional team sits in centralized position and helps various nodes such as business units, product teams, or geographies be successful through training, education, support. See how the Red Cross keeps various chapters organized, especially during life-threatening crises. The central group is aware of what each node is doing and provides a holistic experience to customers with centralized resources Costly. Executive support required, program management, and cross-departmental buy in. I see most companies headed this route, in order to provide safe autonomy to business units. Tip: the hub should be an enabler –not social police. Multiple Hub & Spoke “Dandelion” Often seen in large multi national companies where ‘companies within companies’ act nearly autonomously from each other under a common brand. Companies with multiple products like HP and IBM may naturally gravitate this direction. Business units are given individual freedom to deploy as they see fit, yet a common experience is shared amongst all units Requires constant communication from all teams to be coordinated which can result in excessive internal noise. Requires considerable cultural and executive buy in, as well as dedicated staff. Most suited for large multi-national corporations with multiple product lines. Look closely, the lines connecting the multiple hubs may be severed. Tip: provide way for spokes to connect to each other, not just be funneled through a central group. First, identify which organizational model you’re in. Companies should forward this post to the internal teams to have a discussion on which model they think they are in. What’s interesting is that I often ask internal teams to vote on which model they think they are, and most often not everyone agrees, savvy executives should just observe. The dialog that ensues afterwards is most key. Next, discuss which model is your company’s desired state. Companies must evolve to respond to the social customer, yet their current state may be different than the desired needs. This decision can’t be made in a vacuum various business units, geographical locations, product teams and support and service groups must be considered –this isn’t about marketing alone, instead, put your customer’s experience first. Recognize this isn’t an org chart, it’s a cultural change. Executives and their employees must realize the social web is forcing companies to undergo a cultural change as customers connect directly to each other bypassing companies. As a result, don’t expect these changes to happen quickly or without change management programs. Thanks to Richard Binhammer at Dell who recently at 2010 SXSW shared with me Dell’s “enlightened” state of organic, and Christine Tran, Altimeter Researcher for aid in these graphics. Update: David Armano from Edelman has shared some of his models, great work.